Family members have been threatened through social media and a new report says an emotional support dog was shot 10 times by a veteran and her soldier boyfriend. Details of how the incident was initially posted to Facebook have been released by the Cumberland County Sheriff's Office. 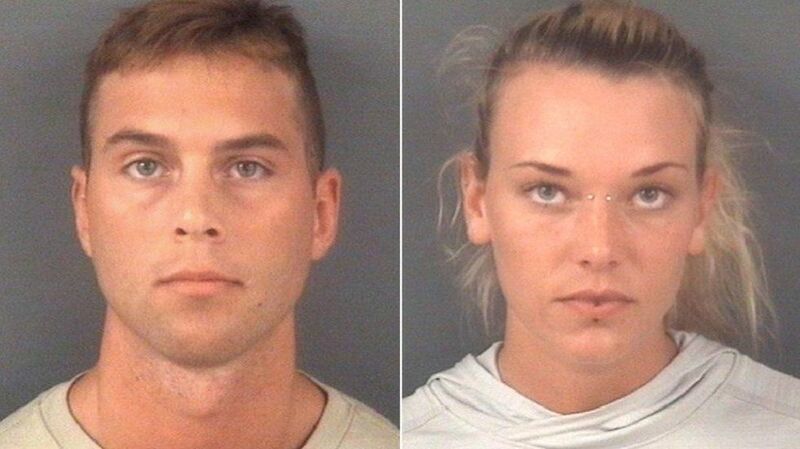 Investigators also said the veteran, 23-year-old Marinna Rollins, and 25-year-old Jarren Heng shot the dog five times each while tied to a tree, and both denied knowing the whereabouts of the dog when first questioned. Rollins' estranged husband, who asked not to be identified for safety reasons, told The Fayetteville Observer that while Rollins has claimed ownership of the dog among her friends, he was in fact the legal owner — a point backed up by Animal Control records. Rollins and Heng each have been charged with animal cruelty and conspiracy, court documents say. Rollins, medically retired from the Army, is jailed at the Cumberland County Detention Center with bail set at $25,000. Heng, whose bail was set at $25,000 in a court appearance Tuesday, is no longer in jail, according to the Cumberland County Sheriff’s Office website. Court documents detailing who bailed him out and his current location were not available Thursday. Heng is a soldier in a unit that reports to the Army Special Operations Command, Lt. Col. Robert Bockholt said. He declined to specify the exact unit. Death threats have been made through social media toward the couple charged, and some of their family members. The story has been shared internationally thousands of times; on Facebook, it was one of the top trending stories Wednesday. The Sheriff’s Office news release said on April 19, Cumberland County Animal Control received a call in reference to the shooting. The caller said a video of the execution of a pit bull they knew as Cam had been posted to the Facebook page of Rollins — a page that has since been deleted. Prior to the shooting, Rollins posted on Facebook that she was sad that her dog had to go to a happier place. The video, investigators said, depicted Rollins’ shooting the dog execution-style as Heng filmed her. Cumberland County Assistant District Attorney Clark Reaves later said the pair could be heard giggling in the tape as the dog was killed. An Animal Control officer went to the residence of Rollins and Heng in the 5600 block of Netherfield Place off Morganton Road in the Westover area to talk. When Rollins said she didn’t know where the dog was, the Animal Control officer "confronted" her with the video. “Rollins then had several excuses as to why they killed the dog,” the release said. A friend of Rollins, who asked not to be named for personal safety reasons, said expenses to keep the dog were cited by Rollins. The Sheriff's Office was contacted by the Animal Control officer. A detective assigned to the case found that on April 16 or 17, Heng and Rollins took the dog to an unknown wooded area, tied the dog to a tree and shot the dog five times each, the release said. Detectives said Heng and Rollins took turns filming each other as they killed the dog, then left the dog in a shallow grave. As of Thursday evening, Sgt. Sean Swain said authorities have not found the dog’s body. Rollins’ estranged husband, also a soldier, said he is desperately hoping that investigators will be able to find the dog so he can give him a proper burial. Friends said Rollins told them that her husband gave her the dog when he was given orders to serve overseas. He adopted the dog that he called Huey from Animal Control in January 2016 shortly after he separated from Rollins. He said Huey was a great dog who once protected him from burglars. When her husband was assigned overseas, Rollins begged to keep the dog, he said. And while he was gone, he says Rollins changed the dog’s name to Camboui and got him registered as an emotional support dog. The Sheriff’s Office release said Camboui, simply known as Cam, was a service dog to help Rollins cope with post-traumatic stress disorder. Friends said Rollins' PTSD is the result of a non-combative incident while she was stationed in South Korea. They also said the dog was only certified to be an emotional support dog, which requires less extensive training than a service dog. Rollins’ husband said all seemed to be well until she began dating Heng in January. That was the same month she received a medical retirement from the Army, a discharge friends said was due to her PTSD and other mental health issues. Heng was controlling, Rollins' friends said. Her husband said Heng refused to let him see the dog. While Heng surrendered to authorities Monday evening, court documents say Rollins tried to avoid apprehension. Both have court appearances May 16. ©2017 The Fayetteville Observer (Fayetteville, N.C.). Distributed by Tribune Content Agency, LLC.